Cyber crime – how safe are you online? The Crown Office and Procurator Fiscal Service (COPFS) are hosting an event at Edinburgh Central Library, aimed at people aged 50 and over, to raise awareness of cyber scamming. How prosecutors consider cyber scam cases. The event is being held at Central Library at 2pm on Thursday 16 February 2017 and may be particularly useful to people aged 50+. Reserve your free place via EventBrite or contact Laura Connell for more information. On the 28th October 2015 the wonderful Scottish Poetry Library re-opened after extensive renovations. They celebrated with a glittering open evening which I was lucky enough to attend. I’m afraid it’s taken me a whole 9 months to post these photos! For that, please accept my deep and abject apologies. The ELISA Winter Warmer will take place on Wednesday, 9 December 2015 from 16:45 to 19:15 (GMT) at the National Library of Scotland. It is a winter celebration for the ELISA community. Including a talk on bibliotherapy by Christine Cather, a chance to meet up with new friends and colleagues plus a discount in the National Library shop. The event started with refreshments and a chance to chat to other attendees and then an interesting talk by the head of the library, Lorna Mitchell. She explained some of the history of the library, how books were bought by the library from 1766 onwards. 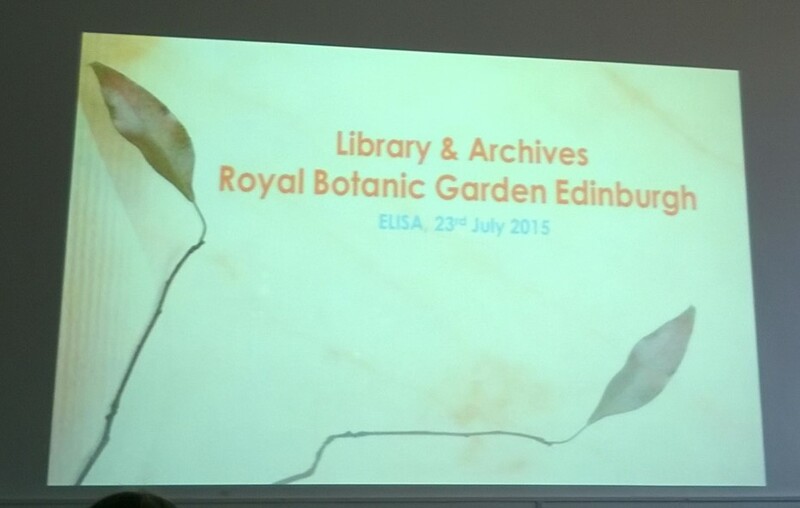 There are three collections – living plants, herbarium and library/archives. 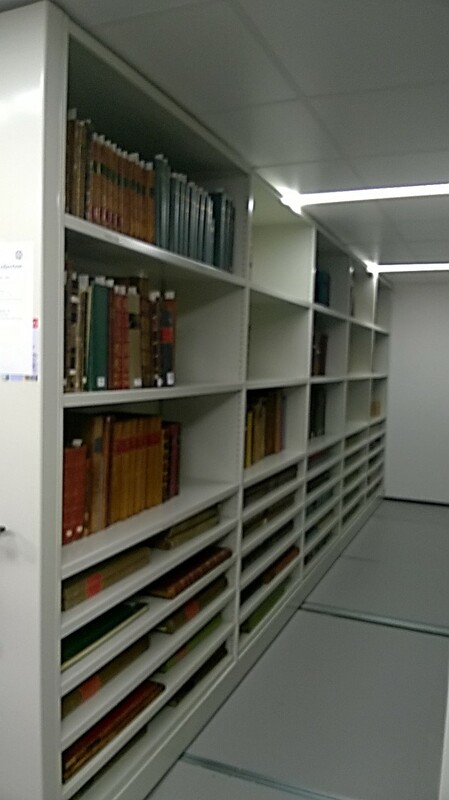 The library now has 60,000 – 70,000 books, more than 4000 journals and a significant art collection including illustrations and photographs. She also mentioned that there are some more unusual items in the archives such as a pony skeleton and parts of a spitfire! 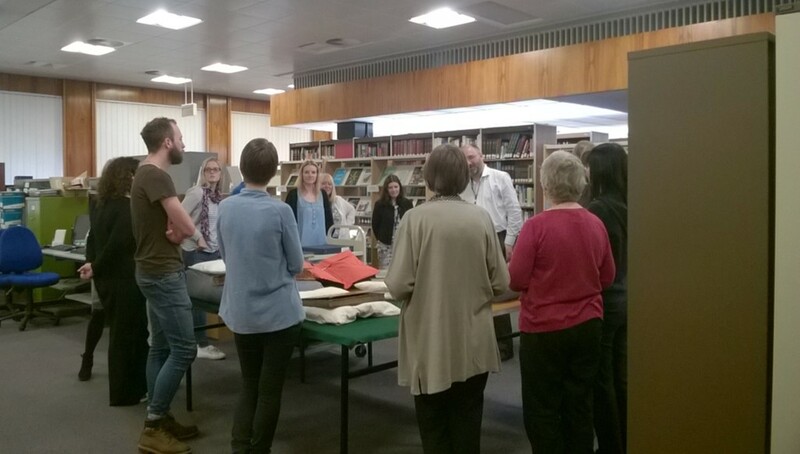 We then split into two groups – the group that I was in went downstairs first to look items in the archives. We were shown some of the oldest items in the collection with notes and drawings of plants that had been collected and studied from the 17th century onwards. There was a book of lecture notes from botany lectures and books of plant specimens. Lorna explained how they are still in the process of restoring and cataloguing a lot of material. It was fascinating to hear about the people that were involved in the history of the gardens such as John Hope (Regius Keeper 1761 – 86) and George Forrest (plant-collector). When we went back upstairs we were shown more interesting collections including books of drawings of plants and fungi which were very detailed and also books of engravings and ink prints. 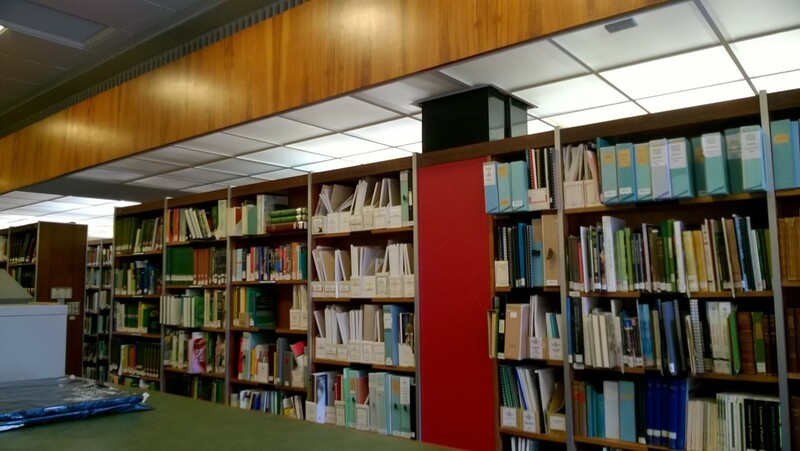 We had a quick look in the library which is open to visitors and researchers. The visit was interesting and informative so if you get a chance to visit, do so as it is definitely worth it and there is a lot more to see and hear about than I have mentioned here.